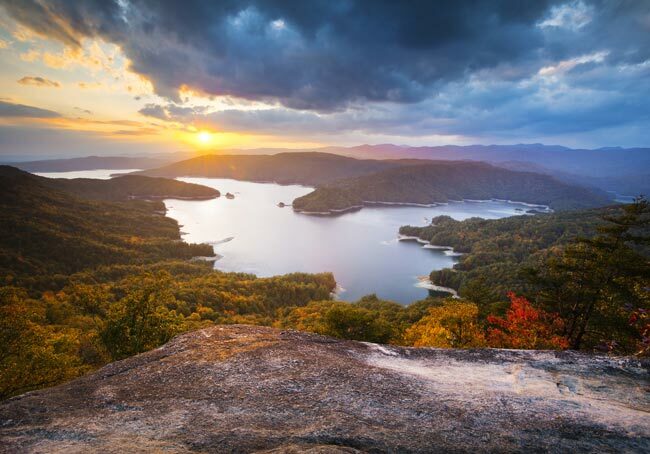 Serene Lake Jocassee is best viewed from Jumping Off Rock, located in northern Pickens County. No one knows for sure how the landmark received its unusual name – you should definitely not leap from this outcropping! – but its untouched beauty makes it one of the most treasured spots not only in South Carolina, but also in the world at large. 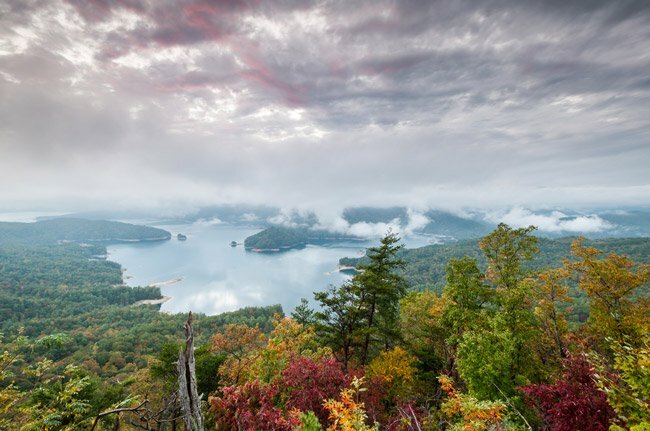 In fact, National Geographic recently recognized the Jocassee Gorges in its list, “50 of the World’s Last Great Places: Destinations of a Lifetime.” The designation was made in honor of the plant and wildlife diversity present in the gorges, as well as the area’s untouched landscape. Part of a series of gorges within the Blue Ridge Escarpment, the Jocassee Gorges provide visitors the experience of viewing a natural panorama with minimal human intrusion. Though hikers might see boats on the lake, the vista here remains uninterrupted by infrastructure or development. 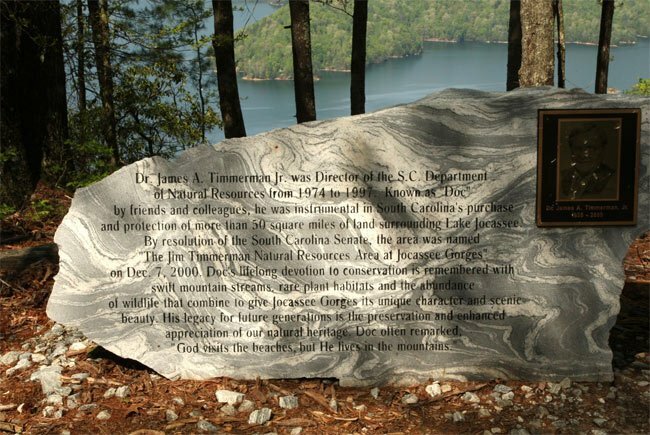 The spectacular scenery can be credited in part to the efforts of Dr. Jim “Doc” Timmerman, Jr. Timmerman, director of SCDNR from 1974 to 1997, was a conservationist who instigated the state’s purchase and subsequent protection of of 50 square miles of land surrounding the lake. As a result, the area is officially known as the the Jim Timmerman Natural Resources Area. Timmerman died in 2005; a monument dedicated to him was placed at Jumping Off Rock in 2010. Having taken a photograph from this viewpoint, I agree with Denise Campbell, no photography can do the scene justice. Jeanie Hoxit, the story you reference has been attributed to many waterfalls in the area, but if you jump from the rock in the scene in my shot, you will only fall about 6 feet and then there is a steep descent but not a deathly plunge. The day I was there two guys came running up the hill so they survived and I bet you would as well. Can you pitch a tent for a night at this location? I heard the story of how it got its name: a maiden's lover died, and the young maiden jumped to her death. SC Raptor closed rihgt now just past jumping off rock with a new gate. also closed at the split so only way in is from the 173 entrance. all side roads closed as well. cant even get to the lake. very rare thing for a majority of trails to be open. that site is incorrect. have not seen it in what i consider open status in about 10 years and i would know because i live about a mile from the entrance. 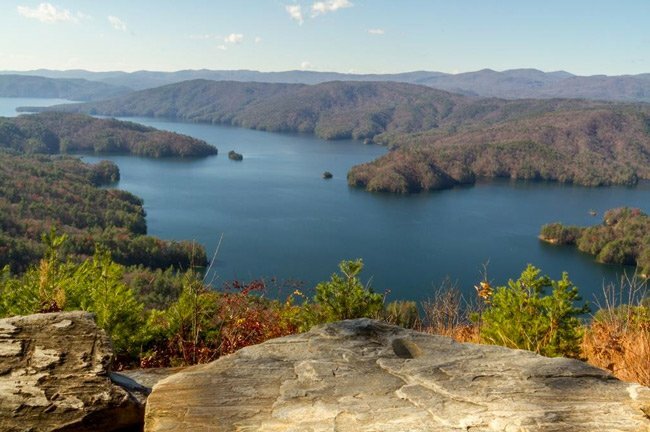 http://www.ExpeditionCarolina.com provides boat shuttle service from Devils Fork State Park that will place hikers within a 2 mile hike of the spot! What a great way to kick off the year!